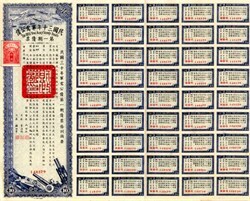 Beautiful uncancelled original certificate from the Chinese 30 Year Army Supply Bond issued in 1941. This historic document has an ornate border around it with a vignette of military planes and artillery and is over 72 years old. 52 coupons attached on right side.